There are more fools in the world than those publicly accounted such, and in the number many who would be highly offended were the least hint thrown out that their names stood on the list. Idiots or common fools, whose minds are so framed that it is difficult to determine whether the weak parts or the strong be the more conspicuous, generally view things through a medium peculiar to themselves, and think, speak, and act in a way distinct from the great mass of mankind. While other men allow the world to become acquainted with only the more rational part of their views, the fool reveals all that comes into his thoughts. Both rational men and idiots build castles in the air. The former are accounted wise because they conceal the airy fabrics ; the latter are esteemed fools, not because they allow their thoughts to run riot, but because they cannot conceal their vagaries from the public. The one may embark in the wildest schemes, and pursue the most headlong course, and still be reckoned no fool ; while the other may say many witty things, and do many rational deeds, and still the world will not account him wise, but will laugh at both his sayings and his doings, because he does not follow exactly the same track nor view circumstances in the same light as the muiltitude. But if the world laugh at the eccentricities of the fool, the fool, in revenge, seems to hold the notions of the world in derision : for while the more rational part of the community are carefully keeping in one common and beaten track, and, individually, would be quite unhappy were they to be singular in their manners and habits, the fool fearlessly bounds into a path of his own formation, and pursues his way through a kind of fictitious region, wherein he seems to find enjoyments of no ordinary nature, and beyond the ken of all ordinary men. "To Jock the fule, my follie free. Of corn and cattle, gold and fee. Thus it would appear that of their foolishness part was real and part was feigned. They were, generally, at least as much knaves as fools, concealing their knavery under that best of all cloaks—simplicity. Their dry sarcastic humour and rude ready wit received much freshness and zest from their wild craziness. They were a link between the quiet helpless idiot and the boisterous madman. They shared of the eccentricity of the latter and of the stupidity of the former, and added to these the sharp-wittedness of the knave. They are now almost, if not altogether, extinct. The fool's cap and bells have long hung untenanted on the walls, his seat by his lord on the dais has long since disappeared, and it is many a day since his sallies have been heard in the hall or at the festive board. The country clachan has still its innocent or idiot, and the crazed madman still wanders restlessly through his chosen district; but it would seem as if these also were soon to disappear. Already they are much less frequently to be seen than formerly, being concealed from the public eye in the cells of charitable asylums. But till within these few years, we have seen several idiots led about the streets of Aberdeen, or wandering to and fro under their own guidance. We recollect one in particular—a most pitiful spectacle—who was led from door to door of the suburbs by a woman, we believe his mother. "Feel Peter," "Willie More," and many others, will be remembered by the youngest of our readers. In a country village it is no uncommon sight still to see, on a sunny day, the innocent seated bareheaded on the stone seat by the house door, or sitting for hours as motionless as a pillar, or wandering about, sometimes carrying on an unmeaning soliloquy, and sometimes running over the air of a favourite song. The race of madmen continued to appear on our streets to a later date. Indeed, we believe "Mourican-room-roum roum" has not discontinued his visits to the present hour. The backs of some of our juvenile readers, we doubt not, will be ready to attest how lately "Jean Carr" brandished her staff, and, single-handed, scoured the streets of a whole schoolful of her tormentors; while the bodies of some of them, perhaps, still ache at the memory of a direful conflict with that renowned amazon, "Lady Leddles." It was in the fifteenth and sixteenth centuries that family fools were most in request. Before the eighteenth century, about the middle of which Jamie Fleeman flourished, matters wore a very different aspect. 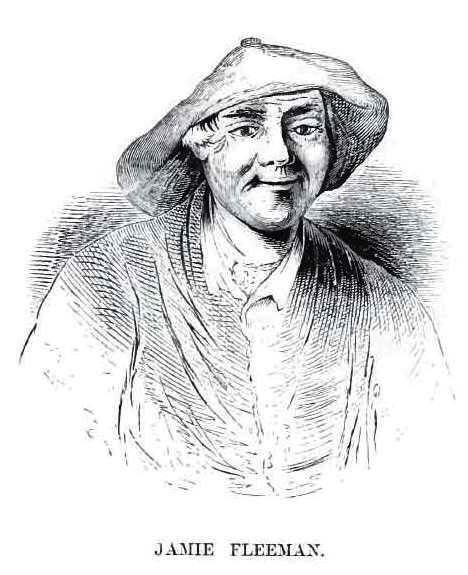 Jamie was pei-haps the ultimus Homanorum, the last of the race of Scottish family fools—a class of beings which the author of Waverley has rendered so familiar to every one by his picture of "Daft Davie Gellatly." Jamie differed from his brethren and ancestors in this, that whereas the great majority of them were "fenyet fules," he was, in most respects, naturally what he appeared to be, and by chance fell into the very situation in which he was capable of acting a conspicuous part. You can download this book here!